Pre-Intermediate level. Ideal for vocabulary building. Bloomsbury Publishing PLC, 2004 - 128 pages. 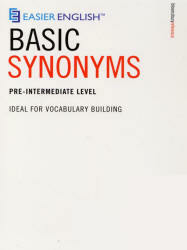 Anyone who wants to write clear and accurate English, using the correct word in a particular context, will find this book helpful, and a useful companion to the Easier English Basic Dictionary. Groups of similar words are arranged alphabetically under the main word for the particular meaning being illustrated, so words meaning ‘big’ are given at big. The ways in which these similar words are used in different situations are compared. Words with an opposite meaning to the main meaning being illustrated (known as ‘antonyms’) are also given. It is designed for any student of English who wants to improve their vocabulary, especially anyone working towards elementary or pre-intermediate learners' exams such as the Preliminary English Test (PET) or the Key English Test (KET). Synonyms and related words are listed for each entry to show alternative meanings and expressions. Each synonym includes a definition and example sentence to help learners understand and use the word in the right context.